We invite you to submit an application for BNI British Columbia chapter membership to lock out your competitors, upon your acceptance in the chapter. You should submit your completed membership application, along with payment, to the Secretary of the chapter you wish to join. You may click here to access a BNI Membership Application in PDF format. Are you an existing BNI British Columbia member who wants to renew? Members are invited to renew their membership online via BNI Connect each year to secure their position in their chapter for another 12 months. 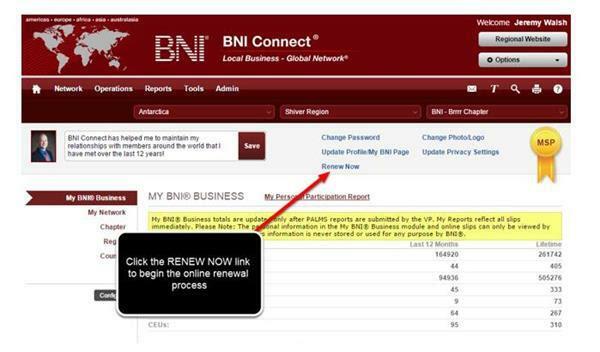 Members are notified by email of their upcoming renewal 90 days prior to their renewal date which gives them time to renew and pay via BNI Connect and gives the chapter time to follow the renewal process. To renew and pay for another 12 months membership please go to BNI Connect and click 'Renew Now' and then follow the link below. Note: If you don't have a paypal account you can still pay via credit card through the buy now button below! Reminder: Please print your receipt and give it to your Secretary Treasurer!